A biography about Leif Nilsson which includes exhibition and educational information. 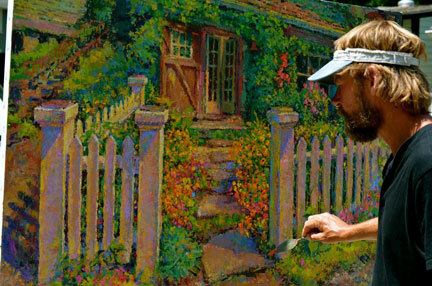 Leif Nilsson painting a composition of flowers en-plein-air in his garden in Chester, Connecticut in the Spring of 2012. More pictures of Leif painting. Inspired by the natural beauty surrounding the Lower Connecticut River Valley, Leif (pronounced LAYF) Nilsson paints his plein air impressionistic landscape compositions directly from life. Setting up his easel in and around his hometown of Chester, Nilsson creates engaging garden, Connecticut River and village paintings that invite the viewer to walk right in. Some of the paintings are completed ala prima, meaning all at once, while others may take several sittings at the same time of day to achieve the correct harmonious atmosphere as he observes it. Generally, heavily textured paintings have more layers applied in an effort to represent the scintillating effects of light in nature over a period of time. Nilsson's brushwork is a result of his dedication to observing nature. Leif Nilsson completed a full curriculum of Classical Studies at the Lyme Academy of Fine Arts in Old Lyme, CT. He enhanced that education with several sojourns to Scandinavia, Asia Minor and Europe where he studied the French 19th and early 20th century painters; Bonnard and Monet for color; Pissarro and Vuillard for composition and Van Gogh for energy. A successful working artist for over 20 years, Nilsson continues to exhibit his paintings in several galleries throughout the United States, while also promoting his work through his website, and at the Leif Nilsson Spring Street Studio and Gallery, LLC in Chester where collectors visit him regularly to view and purchase his latest works. The studio is open on weekend afternoons from noon to 6:00 pm and other times by chance or appointment. Six times a year he hosts a gallery opening reception for his newest works along with other galleries in Chester. He also teaches painting to children and adults and gives lectures at high schools, universities, art clubs, and museums. Nilsson has hand-made most of his Florentine style, metal leafed, finished corner frames in his studio. The soft luminous gold tone complements his paintings without overwhelming them. Now he orders them from reputable framemakers and assists collectors with their choices. Click here for a sample and a testimony! Limited Edition Fine Art Prints have been made of several of Nilsson's original oil paintings. A complete catalogue of these is available on-line at www.nilssonstudio.com and in his Chester studio. Chester is a favorite subject of Leif Nilsson's. Its uniqueness and charm have captivated his imagination for years. He has painted many scenes of Chester Center in different times of day, weather conditions and seasons. The vernacular architecture of old crooked buildings lining the curved piazza of Main Street come alive in his colorful paintings of the village in springtime with Rhododendrons in full bloom. Winter is a favorite time of year for him when the town is blanketed with virgin snow, especially at dusk when snowflakes swirl around the glowing lamppost in front of his studio. The Connecticut River as seen from its' banks in Chester to Old Lyme offers a wealth of pictorial opportunities for Nilsson to explore. From the hazy dawn of Eustasia Island in Deep River to the quiet harbors of Old Saybrook's North Cove and from the golden marshes of Chester to the sweeping meadow of Pettipaug in Essex, there's plenty of material to keep a landscape painter busy yearlong. Occasionally Nilsson travels abroad to interesting European villages. His little paintings of Prague in the Czech Republic, Casares, Spain, Italy, Portugal, Ireland and Nova Scotia, Canada from recent trips are also favorites among his collectors. One of his favorite pastimes is to play the banjo. His new band "Arrowhead" is quite active! View the Scrap Book of Newspaper Clippings from the early 1990s. Much more publicity listed in the "scrapbook" and on the "Events" pages.